When I speak to audiences about Clicksand, I always make the point that those who sell online marketing snake oil (I call them pitchmen) know that what they’re selling is bad for businesses. The data, decisions, and dashboards that are built into online marketing are designed primarily to make the product addictive, just like casino gambling. The pitchmen have simply learned that the more data they throw at their customers and the more tactical decisions they involve customers in (which keywords to use, how much to spend, what text to put into the ad or email subject line, what micro-demographic to target, and so on), the more those customers become engrossed in the process of using online marketing and the less they notice there are no real results from their efforts. In effect, the pitchmen have built a system that mesmerizes business customers and distracts them from reality. This idea that online marketing pitchmen are purposely building products that are addictive is something that Clicksand readers and the audiences I speak to often have the most difficulty believing. And, of course, the pitchmen themselves would never admit to it. But occasionally, we are able to catch a glimpse of reality. In September of 2017, Constant Contact came out with a television ad that demonstrates how much they know about the addictive power of their service. 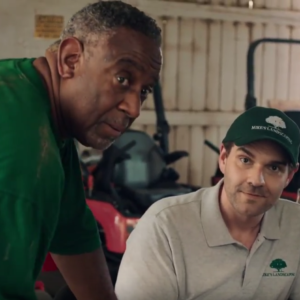 The ad, entitled “Powerful Stuff: Watch Together,” shows a fictional small landscaping business that has sent out emails using Constant Contact. The ad shows the staff being disappointed with a co-worker who couldn’t wait to look at the results of the campaign. “We were supposed to watch that together,” laments one of the characters. “I can’t even look at you.” Then another employee comes into the shop and starts to ask, “Hey guys, when are we gonna look at the …,” only to stop when he realizes that his co-workers went ahead without him. On the surface, the ad just seems like a cute bit of playful interaction between the fictional co-workers. But commercials like this are not created in a vacuum. Companies (and the ad agencies that help them) create ads based on what they learn from customers. I’ve been involved in work like this myself for over 20 years. Through focus groups and other research studies, companies find out what customers like and dislike—and they play up the positives. What online marketing companies will naturally hear in their research studies is that people love data, interactivity, and being involved in making tactical decisions about their marketing. The “Watch Together” ad shows that Constant Contact knows how powerful it is for customers to be involved in playing with the content of emails and looking at their campaign data and dashboard reports. It’s so powerful that a) the first person in the TV ad can’t wait until the agreed-upon time to look at the results, b) it lures in employees who aren’t even involved in marketing to watch it, and c) it even causes employees to stop doing their jobs to get involved in the fun (all of the fictional employees are originally engaged in landscaping activities, which they stop in order to try to see the marketing results). Is it really as bad as I make it sound? The question becomes, then, whether I’m seeing conspiracies where none exist. Those who don’t believe my warnings that the pitchmen have built online marketing tools to be addictive and distracting will simply see a cute, fun commercial that shouldn’t be taken seriously. But those who have experienced the addiction and distraction in their own companies will recognize a pattern that is potentially dangerous—and they’ll see Constant Contact’s “Powerful Stuff” campaign in a different, more sinister light. “Powerful” indeed. If you’re feeling skeptical as well, let’s chat.